I’ve managed to finish this weeks homework for the Lizzie Stitching Wallet stitch-a-long in plenty of time. This SAL is being organised by Faby Reilly, I’ve stitched a few of her cross-stitch designs now as I really like her style. We started nearly three weeks ago and I think we’ll finish mid October (from memory!) The patterns are being released every one or two weeks, depending how much stitching we need to do. This week we’ve been adding the detail which is where I love Faby’s style, the back-stitches cut across the cross-stitches but the eye just sees the outline of the flower. 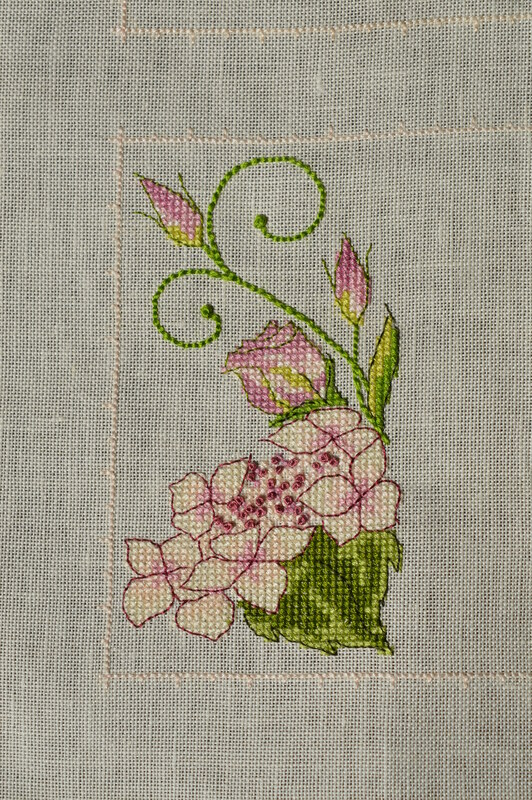 The hydrangea flowers look gorgeous wth the back-stitching and the buds are embroidered with colonial knots, this was a new stitch for me. We had the choice of french or colonial knots, I’ve used french knots many times so I decided it was a good time to learn a new one. Faby has a great tutorial which shows the two stitches on her website. The results are very similar, but somehow the colonial does seen firmer and flatter. These were stitched with 3 strands of threads, I’m not sure if you want a bigger knot if you can add an extra loop like in french knots or if you just use thicker thread. The stems are stitched with the full six strands of floss, it went through a lot easier than I thought it might and to my surprise the short stitches over two threads seemed neater than the longer ones over say four threads. 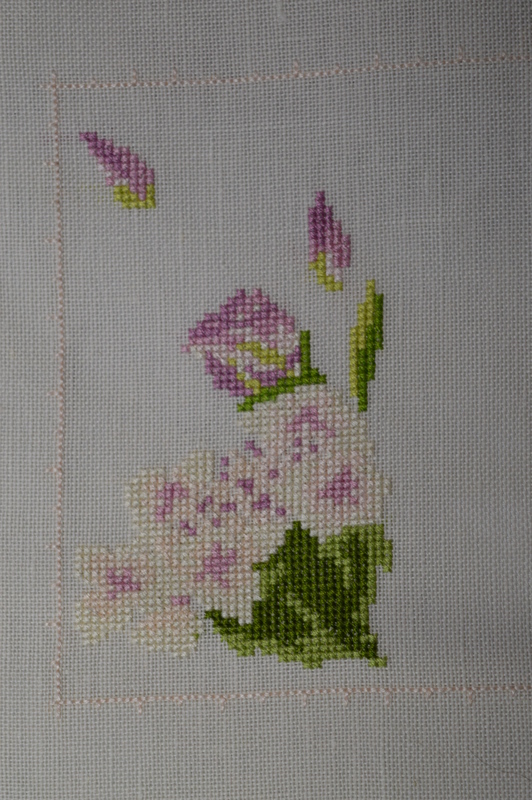 There are still some beads to add in the centre of the hydrangeas and also around the curl of the frond, but as I’m using an embroidery hoop I’m leaving that til the end, I’m bound to squash them under the hoop otherwise. Our next pattern comes out on Monday, if you’d like to join in the SAL I think you have until Monday to sign up, after that you’ll have to wait until the end of the SAL to buy the pattern! I’m linking up with Kathy’s Quilts tomorrow for Slow-Stitching Sunday, a weekly celebration of all things hand-stitched. Why not follow the link and see what everyone else has been stitching. This entry was posted in embroidery, Serendipity, Stitch-a-long and tagged cross-stitch, Faby Reilly Designs, Lizzie Stitching Wallet. Bookmark the permalink. Thanks Del, I think it’s going to be very pretty, and probably pretty pink too 🙂 These stitches are 16 to the inch and thats as small as I can reasonably do now! What a great design! I love the colours, and as Kate said, the backstitch makes such a huge difference with this piece! I’m not sure I know how to stitch a colonial knot, but you are right, they are definitely larger and firmer! Thanks Catherine, the colonial knot does like a figure of eight around the needle, Faby’s got a tutorial on her website which shows the too knots together. back stitch really brings this design to life! It does, Faby always works wonders with back-stitch! I love how backstotching makes those flowers pop! I think the back-stitching really brings those flowers out. This piece is really pretty. Thank you Carole, waiting for the next installment now! That is truly lovely, beautiful work. What a satisfyingly beautiful piece of work. I enjoyed your explanations on why you are enjoying stitching this. I have never heard of a colonial knot. I’ll have to look that one up. Thanks Robin, I never knew the difference between the two knots, we learn something new every day! Pink and green is a winning combination, and this looks so pretty. I hadn’t heard of a colonial knot, so I am going to look it up too. Looking forward to seeing your progress. PS I love the stitching you did in the Sketchbook. The page of little embroidered tiles is beautiful, and I had to look carefully at each one. That is amazing how the back stitching and knots add so much definition and beauty! Thanks for linking up and sharing this lovely project with us!